After Effect • View topic - Heroic General Nazgrim Down! 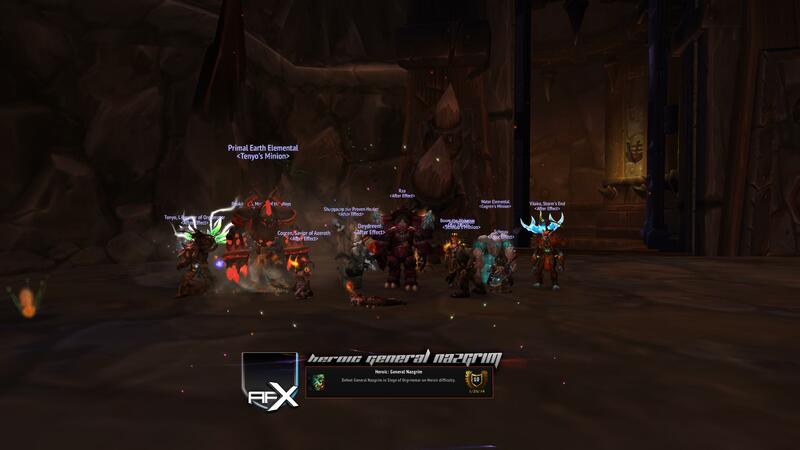 Re: Heroic General Nazgrim Down! Actually looking at that now....WORST SCREENSHOT EVER! Cant see stormy because of Dims minion, fxr is about to fall over, fops has died, jupsik's minion is covering me, jupsik is just backwards and Jonnie is missing? Poor Vaako at the end looking at us thinking "what the hell have I got myself into D:"
also what is that ghost grass looking thing on the left there? B00rz wrote: Actually looking at that now....WORST SCREENSHOT EVER! Well Dribbler effect keeping up the appearances. Probably best choice looking at the state of that. Well it was the only one where the boss was actually in the screenshot. He had despawned in the rest. The boss is less visible than Stormy is tbh! Dimon wrote: The boss is less visible than Stormy is tbh!